Michael Flohr paints in a style called urban impressionism. His atmospheric street scenes are brilliantly composed with bold color applications and fascinating narrative lines. Meet rising star Michael Flohr. The original he’s working on will probably sell within hours of being displayed in a gallery, for this talented, hard-working young man is riding a wave of popularity with the public--and growing esteem from the art community--that gains momentum with each new painting and limited edition release. Michael Flohr grew up in Lakeside, California, a rural area outside San Diego where his parents owned an auto repair business. At a young age it was found he suffered from dyslexia. As a result, his parents arranged tutoring consisting of math, reading, and best of all, art classes, where he excelled. Michael Flohr attended the Academy of Art College in San Francisco, experimenting with all disciplines and styles. 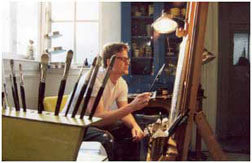 In his final year he was accepted into the prestigious New York Society of Illustrators, joining such luminaries as Norman Rockwell, N.C. Wyeth and Maxfield Parrish. He took his degree in 2000. Three of his student works were selected for exhibition at San Francisco’s M.H. de Young Memorial Museum in Golden Gate Park, the city’s oldest public art museum. After graduation, Michael Flohr traveled extensively in Europe. In Rome, a candlelit exhibition of Monet’s work left a lasting impression. He also studied the work of Manet, Pisarro, Degas, and Toulouse-Lautrec. Back home he synthesized all this powerful input into his own unique style. Flohr’s style has been described as a combination of avant-garde, abstract expressionism and impressionism. “I love the colors of Cezanne,” says Flohr, who also favors pure pigment straight from the tube. He can be seen around town in nightclubs, bars and cafes, sketchbook in hand, capturing the shifting colors and dynamics of people as they mingle and interact. “I do not work with models. I prefer to sketch ‘in the moment’ as a scene unfolds…” reports Flohr. The artist has recently been commissioned to create an album cover for jazz/swing musician David Patrone, a uniquely apt collaboration.